Birgit Koopsen has had this amazing 31 day gel plate challenge over at Instagram. To check out her out of the box skills on Instagram she is @birgit_koopsen and if you'd like to peek at mine search for @pinkbunkadoo. After this challenge I have an unruly pile of monoprints on the corner of my desk that absolutely would be a waste not to use. Thus this post was born. 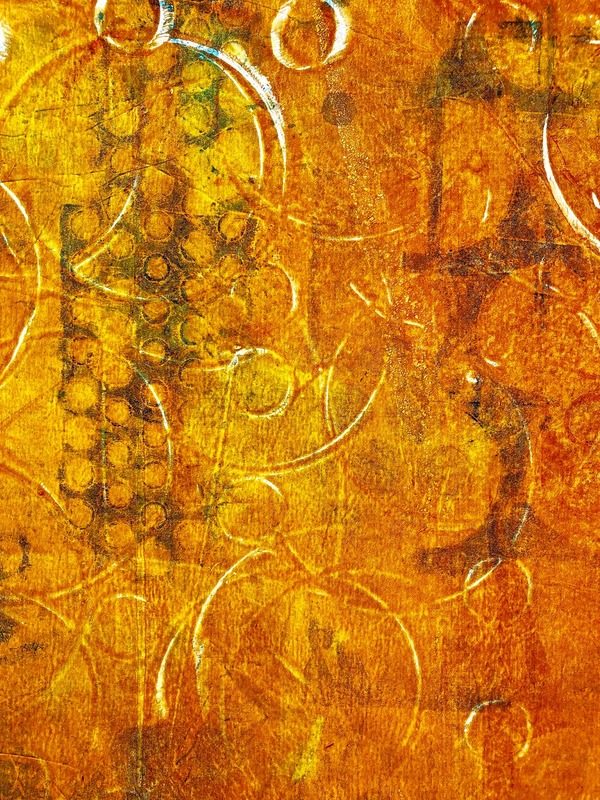 I have a 12 x 14 plate that is perfect for deli paper, and deli paper is perfect for gift wrap. Deli paper is quite thin and easier to fold, but a smidge more sturdy than tissue paper. 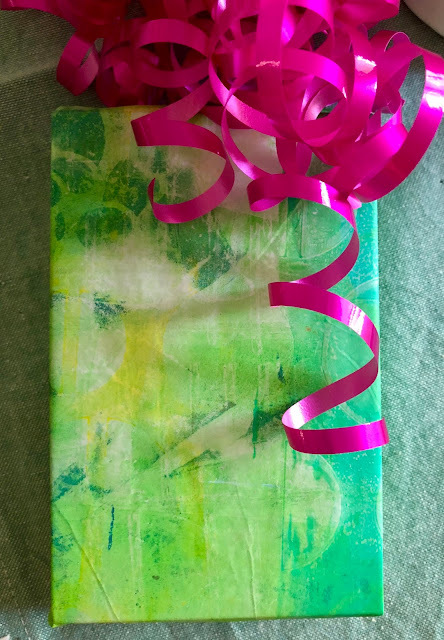 Wow your recipient with one of a kind gift wrap. Dina Wakely recently shared a photo of some of her art hanging in the guest room of her house. She said we should live with our art. 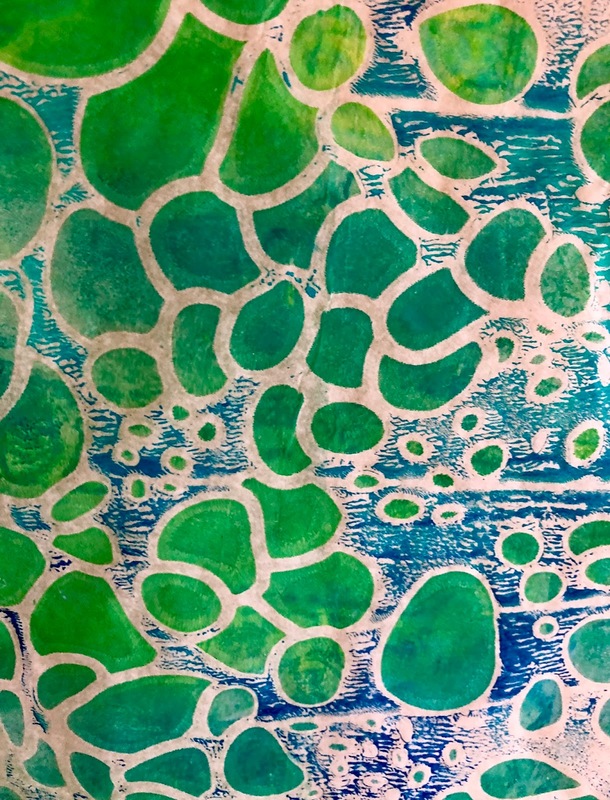 Look through your mono prints and choose a favorite or two to display. If you're not ready to display, snap a photo. 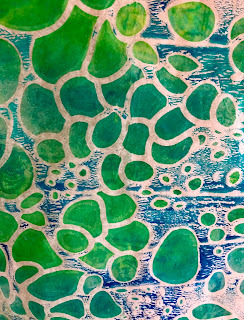 Mono prints are striking wallpapers for phones, tablets and computers. This print will be in my Etsy store Pink Bunkadoo soon. Use Number 3 --make elements for future projects. 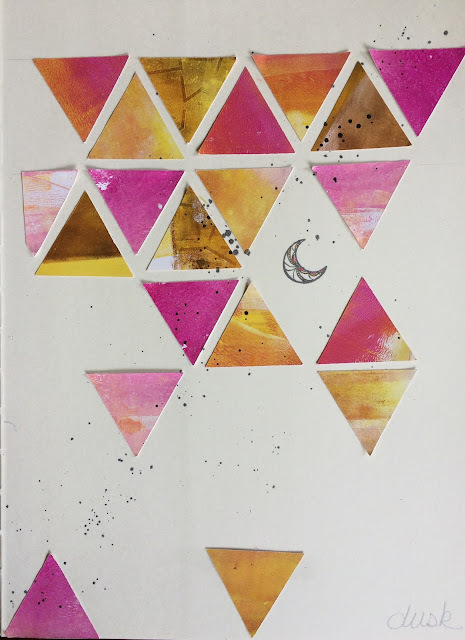 Cut those gel prints with punches and scissors and die cuts and you have your self some wow elements for future paper crafting. Some always useful shapes are hearts, strips, boxes, and then your favorite that calls to you. I'm super fond of hearts and leaves. 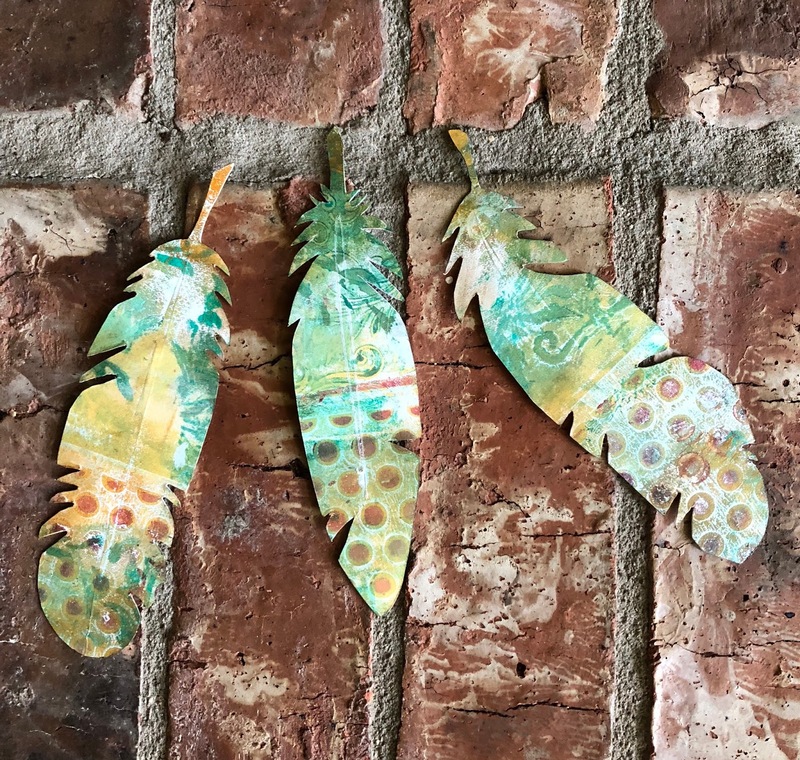 Butterflies from mono prints would be amazing. I'm going to try that! Find a beautiful print and cut it to the size you need. I cut mine to 4 x 5 1/4 for the cards I made. Then find a detailed stamp--one that is mostly black when you stamp it. For my cards I used my Vintage Geranium stamp. 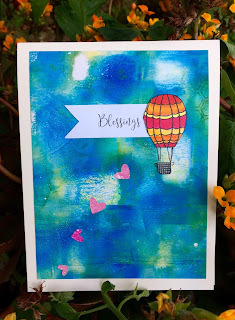 It is perfection for a quick mono print card. Stamp your stamp in black. I used Memento Tuxedo Black. Add a sentiment a voila! a really quick card. 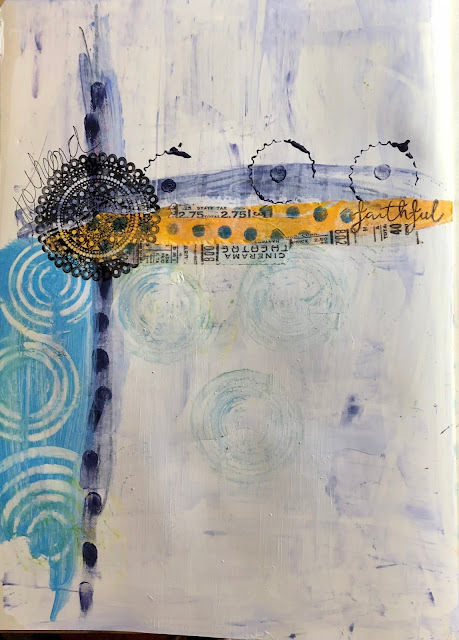 Use Number 5 -- Add some mono print to your art journal or mixed media project. 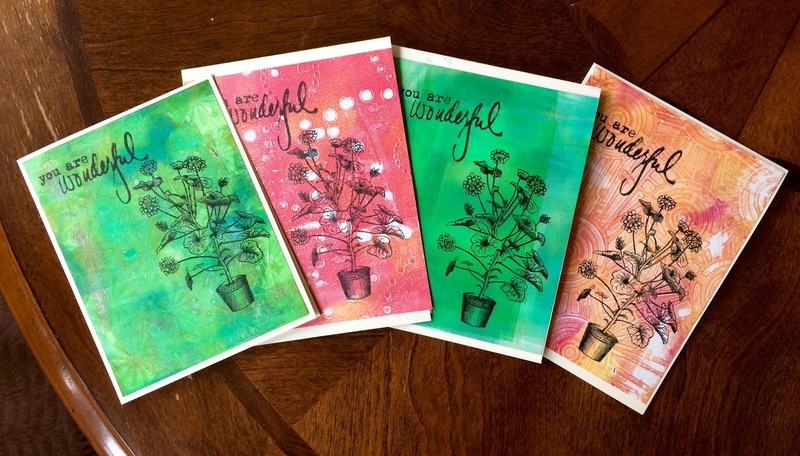 Your personally made mono print add so much more than regular patterned paper. You don't even have to use a lot. Thanks for popping in. 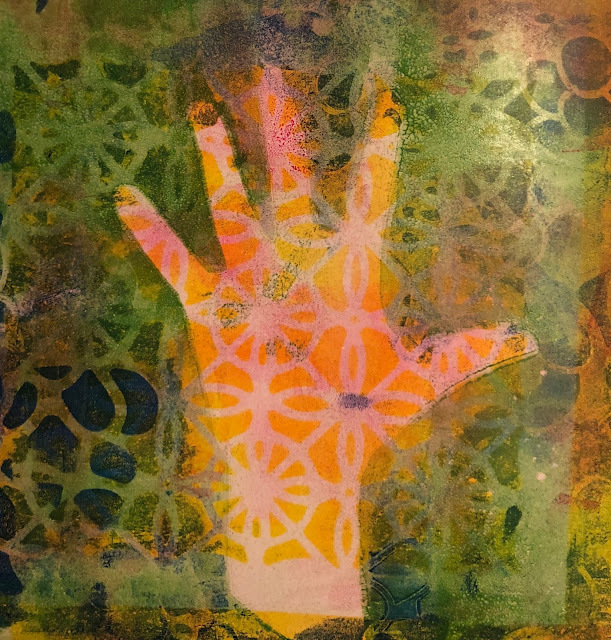 I hope you find new ways to use your monoprints or a renewed interest in looking at what you've made a different way. 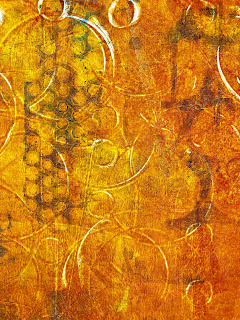 Mini Moondal Stamp is out of stock, but check out the Moondala Stamp Set.